School of law, Christ University has emerged as the best educational institute in Karnataka because it is the first university in the state to have the honor of being accredited with an A+ rating by NAAC since 2005 , it is recognized by UGC and also Bar Council of India approved. School of law, Christ University law entrance exam is called CULEE and its 2018 edition is going to be held on April 24, 2018. The interested students can apply from December 8, 2017 to April 14, 2018 on the official website https://christuniversity.in/apply-online. Once the exam is over the wait for the Christ University law answer key begins, and the following information regarding the CULEE 2018 answer key should be known to you. The CULEE 2017 Exam Answer Key was released within 2 days of the exam so the same trend will be maintained this year and one can expect Christ University law exam answer key list by April 27, 2018. . The exam authority and the convening body of CULEE 2018 will announce answer key of Christ University law entrance exam and once this answer key is in the public arena the students can calculate their marks using the same. For this the students have to know the marking scheme. One mark is allotted to the students for every correct answer, and .25 marks are deducted for every wrong answer. For every question left unanswered there will be no change in the score which means unanswered questions get you a zero mark. The total marks in the exam are 120 i.e. the maximum score is 120. Now when you have calculated the score you have to look at the cut offs. Past year cut offs are a good indication of what the cut off for the current year i.e. 2018 will be like. If your score is much above the cut off for last year then it is an indication that you will get through and be called for counseling wherein written assessment, micro presentation, group discussion and personal interview rounds will take place. 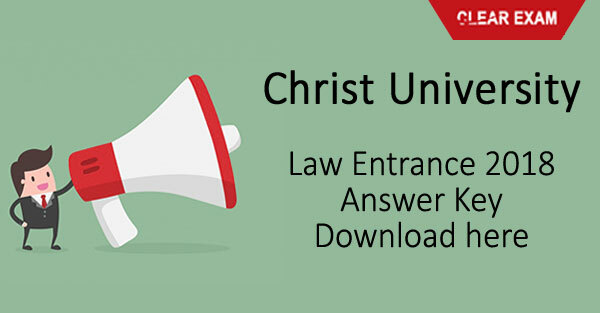 The aim behind the Christ University answer key notification is making students aware of their tentative law entrance exam scores so that they can assess if they will clear the first entrance round and be called for counseling where the further rounds of selection are held. This way the students who are expecting a good score can start preparing for the remain rounds of selection. 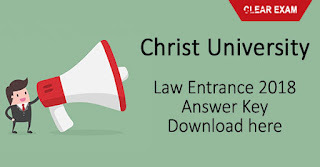 Check the Christ University Law Entrance 2018 Answer Key. Download here CULEE Answer Key.